Team USA defeated Team Canada in a thrilling shootout last Thursday, January 5, to win the gold at the annual IIHF U20 Junior Championships held in Toronto and Montreal, Canada. Troy Terry had earlier scored 3 shootout goals in the semifinal against Russia to advance the team to this gold medal game. 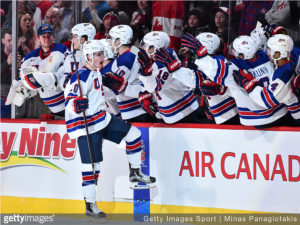 Both teams were strong from the start, with Dylan Strome (Arizona Coyotes prospect) captaining Team Canada and Luke Kunin (Minnesota Wild prospect) leading Team USA. USA had shown their resilience throughout the tournament against difficult teams such as Switzerland and Russia with elite goaltending, better-than-expected defensemen, and a long list of scorers. As Coach Bob Motzko put it, “The strength of our team is the depth of our team,” where every player had clearly stepped up to their role. And although Team Canada was on home ice, USA put an extremely determined effort, closing Canada’s 2-0 lead in the second period and ending regulation time tied 4-4. Overtime eventually resulted in a shootout, and North America’s rivalry for the ages was tested in these final minutes. In a miraculous five-hole attempt, Troy Terry was able to score the only shootout goal on Carter Hart, erupting cheers from Team USA’s bench and winning the game for the team. No one was able to score on USA’s goalie, Tyler Parsons, who made 46 saves in the championship game and had a 0.918 save percentage in the tournament. Celebration wasn’t heard much in the Canadian stands, but American NHL players such as Auston Matthews and Alex Galchenyuk expressed their support on social media. This is the fourth gold won by Team USA in tournament history, and these boys hold promise to win more titles in the future. Terry is currently a star forward for the University of Denver Pioneers and a prospect for the Anaheim Ducks. He is being compared to USA’s TJ Oshie, who had performed a similar trick against Russia in the 2014 Sochi Olympics and is known for his shootout prowess with the Washington Capitals in the NHL. Don’t be surprised if both American and Canadian players are seen playing in the NHL in a few years. Sunjana Varma -- opinionated junior at Hills West by day, avid sports fan by night. Editor of Fashion & PR. Enjoy my writing!